Hello there! Meet my friend, Christine Hoover. She's been with us before and I'm delighted to have her here again. She's a beautiful soul doing life in Charlottesville, Virginia as she invests in her church and community as a church planter's wife. She's delivering some powerful words on friendship as she has just released a book entitled, Messy Beautiful Friendship. At that time, I was a young pastor’s wife, a young mother, and young in my understanding of God’s grace. When I picture myself in those years, I think of myself in two places: in my home and all tangled up in my own head. After college, I’d waited for friends to appear, as they’d appeared in every other era of my life--through youth group and band and softball teams and housemates. And they in fact hadn’t appeared. 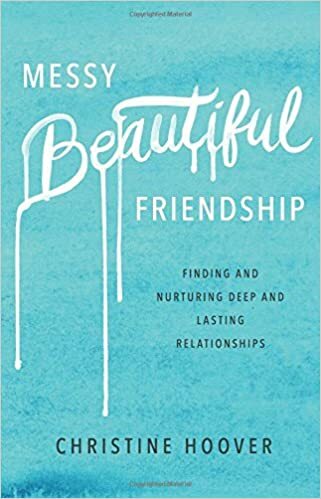 I felt as if I’d forgotten how to do friendship and wondered if I was no longer friend-able. In my insecurity, I remained isolated, both in my home and in my head. Whether we’re new to a neighborhood or a church, whether a good friend has moved away or died, or whether a once close friendship has shifted, any type of change or separation can arouse a sense of loneliness and longing in our hearts. When we have them, we long for healthy relationships and happy life circumstances to remain static. We long for deep community and a sense of belonging. We long for the good old days when friendships came easy and we could enjoy those friends without all the adult responsibilities and burdens mixed in. Longing is not a misplaced desire. In fact, the longing for friendship is a good one. How we pursue or respond to that longing, however, is important. We must remember that perfect relationships and perfect community and perfect circumstances do not exist on this side of eternity. Knowing that life and friendship will always be imperfect helps us embrace what we do have as grace and gift, even if the current gift is aloneness. Our aloneness is a gift because it teaches us to turn our desires to the Lord in prayer and swells our hearts with a hope and eagerness for our true home with Jesus. Sometimes God may love us best by calling us to aloneness, precisely so that He can meet us intimately in a time when He has our full attention. We can be at peace with our aloneness, knowing that we have access to God and can cast all our cares and desires upon Him. Because all is gift and grace, we can wait in aloneness with eager expectation of how God might also give us the gift and grace of togetherness. Curiously, many of us seem to be standing beside one another, holding identical longings for friendship yet resolutely believing we’re alone in them. The truth is we aren’t actually wandering alone; we’re practically tripping over each other as we grasp at our dreams of friendship that is perfect and easy. These ideal dreams of friendship are often created and watered in our loneliness, and these dreams produce bitterness as we begin demanding from others and from God according to our exacting standards. I certainly speak from experience. As I look back at my twenties, I see a lonely girl with a stubborn wish-dream. I see a lonely girl because of the stubborn wish-dream. A friend, according to my dream, would have been in her twenties (like me), been married and had children (like me), and understood what ministry entailed (like me). At the same time, I was afraid to ask for help, afraid to initiate, and deathly afraid of being vulnerable. I wanted the gift, but I was unwilling to do anything to receive or unwrap it. I did pray, and I did cry. And all throughout that time, God was answering. He was good to me in my aloneness; He was the friend who was constantly present. But He was also answering with real people, imperfect people (like me), who lived beside me and went to church with me and who were a few steps ahead and behind me. I see this now, but at the time I couldn’t see past my wish-dream, my standards, and all my bitter longings. If I’d just looked around and if I’d just have been willing to take a few risks of vulnerability and initiation, I would have experienced the answer God was trying to give me. You can find Christine Hoover on her blog and on instagram.